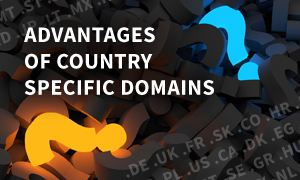 Why you should register country specific domains? Country specific domains are extremely important for local markets. They are a relatively low investment which in almost all instances will yield a positive return in terms of increased traffic to your website(s), and in the end generate new clients and orders. For instance, for a German or Chinese potential customer, the local domains .DE and .CN will always be the first choice when looking for a supplier of goods in their own country. Another highly important reason to always add local domains to your local markets is that Google (and other search engines) will rank it higher than a generic like .COM, .NET etc. when someone is doing a local search on for instance www.google.de. Country specific domains are not only an investment, they are also a defence against future interests or intrusions. Cybersquatting, the illwilled registration of third party domain names with intent to squeeze the rightful owner for money, is a major industry. Literally, a Multi Billion Dollar industry! The risk is not only limited to cybersquatters. Consider also that you are selling a specific product, and/or maybe your product or company name is partially a generic name. If a competitor were to acquire the relevant domains, you may never be able to win them back. Even if you site is not physically hosted in the geographical location of a country, a local domain gives Google a clear signal that it should be shown in the right place in search results. If your site also use a local server, that would add an additional boost. Its much easier to create an understandable site architecture in a local language, rather than trying to play with a .com and “stuffing it” with several languages. A stand alone local site, will be considered independent by Google and given its own ranking. If in the local language, it will obviously rank for local keywords. Having a local domain also helps in your link building programs. Other sites in the same country are much more likely to link to you if you have a local domain. But it’s especially true that they’ll be more interested in receiving links from you if you’re local – after all, they need local links too. Many local directories will only accept local domain names in any case. Links between sites of the same .com are less valuable than links between truly international versions using local domains. So a site which splits its .com into many countries has an opportunity to reap some benefits from the many different domains it now controls. Another consideration, and a strong incentive to register local domains now, is that you may need them later in your marketing. If you let someone else grab them, you may not be able to use them in the future in campaigns, sites or as landing pages – or you will incur very heavy costs trying to buy the domains back from third parties or competitors, or filing domain disputes. A single domain can easily cost 5-10000 USD to buy back, as can the legal fees for a domain dispute. Opting not to register a local domain, and/or creating a local site (with local hosting), may result in added SEO costs necessary to achieve the same positions in Google as their local domain would provide instantly and without additional costs.